Anyway, so, when Michael’s asked me and the other makers to highlight a new way to use their new Floral Market, I was at a loss. They tell me they have over 500 new styles, but it’s alllll new to me. Ruh roh! But then, it turns out I’m helping to host a baby shower and goshdarnit isn’t this the cutest thing you have ever seen?! Get it? 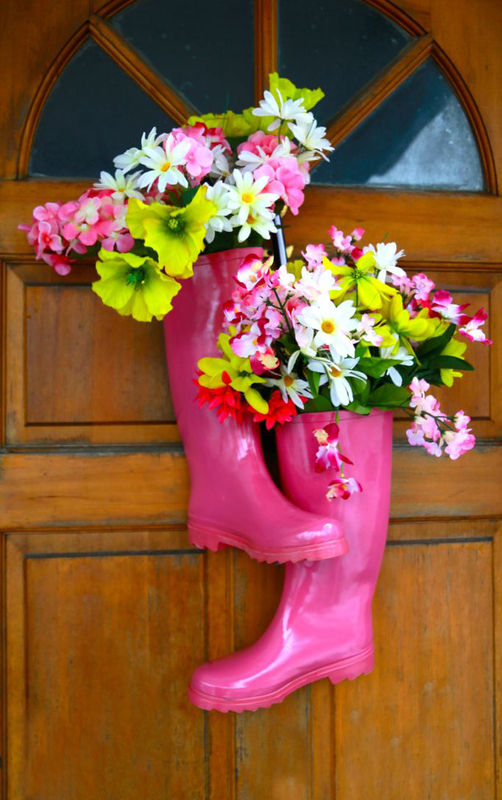 Rainboots. Shower? Baby shower? Okay. Now that it’s been officially over explained, let me show you how I did it because it could not be easier. Zero flower arranging skills required. Thrill: Tall and delicate cherry blossom branches. I also bought a couple of jumbo peonies to anchor the front. Spill: Celery green dangler things. Not sure the name. If I was doing this with a non-pink scheme I would have gone with an ivy but I wasn’t digging it this day. 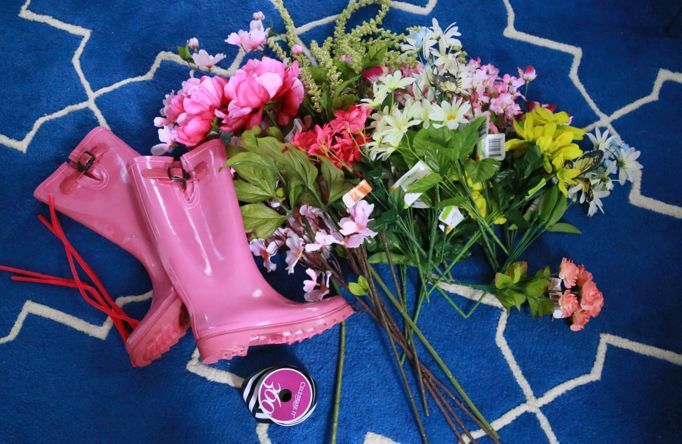 Fill: A whole lotta pink and white flowers, mostly the inexpensive mini-bunches. This arrangement took five minutes. 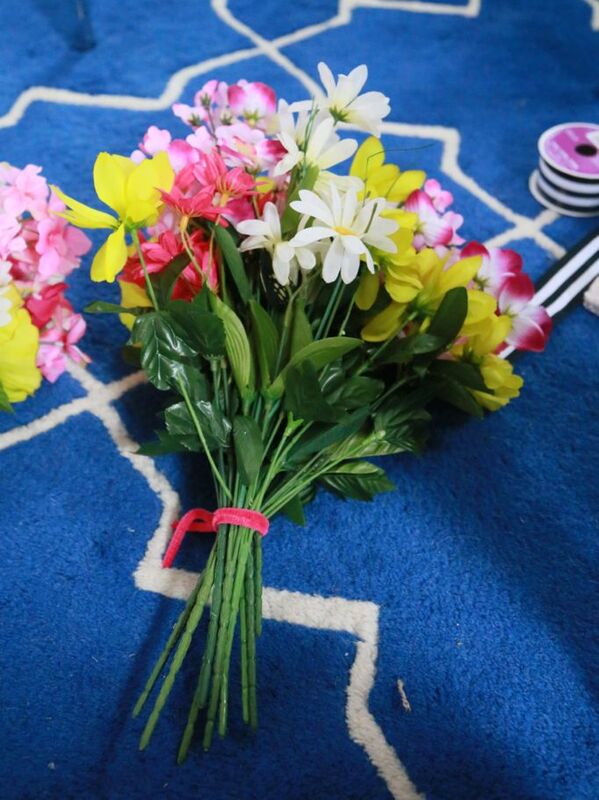 All I did was bundle the ‘fill’ flowers into two bouquets with a pipe cleaner. Then dropped one in each boot top and hung on the door just so I could get a sense of space. How are they hung? Just a piece of wide ribbon tied around the buckle of each boot. No harm on the boot front – thank goodness. I know you were all worried. Now back to the flowers. Next, I inserted the cherry blossoms in the back and the dangly pieces in front. And there we have it. 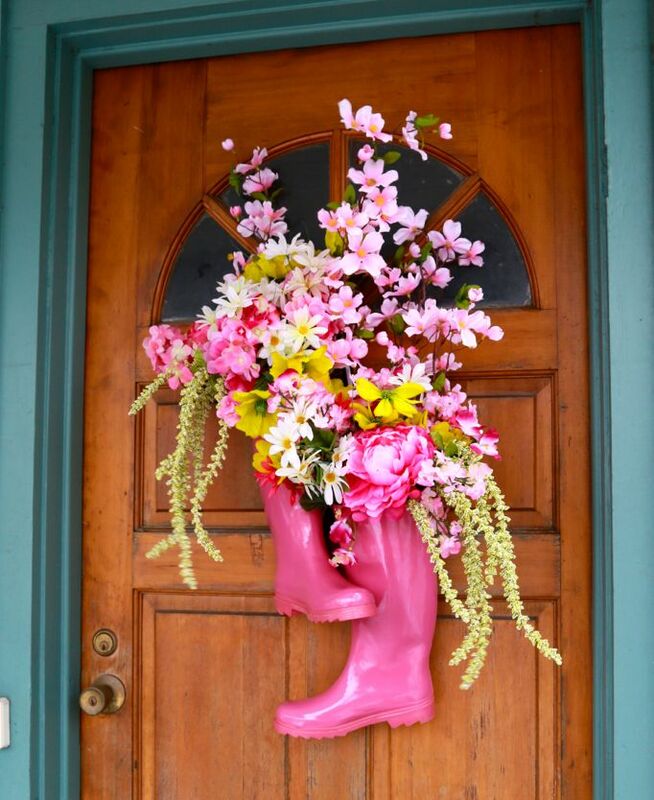 A precious door front floral arrangement fit to welcome a new baby in style. Or, no baby needed! It’s prefect for the whole spring season. If I had my druthers, I might go back and make it with yellow boots and blue paper flowers but let’s be honest, I’m not that ambitious. And paper flowers won’t last a day outdoors in March in the Midwest. So, you win, silk flowers. I’ll see you again! 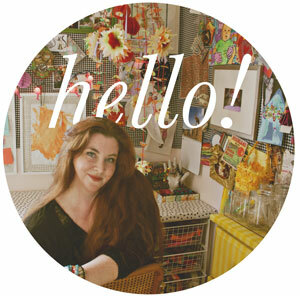 Interested in seeing some other ideas of what can be made with faux flowers? Check it out! This is amazing. If I didn’t already have 3 spring-ish items for the front door, I’d make this in a heartbeat. You have now reminded me that I need to put something on the door since I removed the Valentine’s heart. That’s the problem. I have neat stuff, but I forget to put it on the door. Should I go with the wreath or the swag? Yellow boots with blue flowers? Green boots with multicolors of greenery. Silver boots with red and green and glitter for Christmas. I think you’ve started a trend. I know what you mean about door fatigue! I need more doors to give me an excuse for more wreaths! 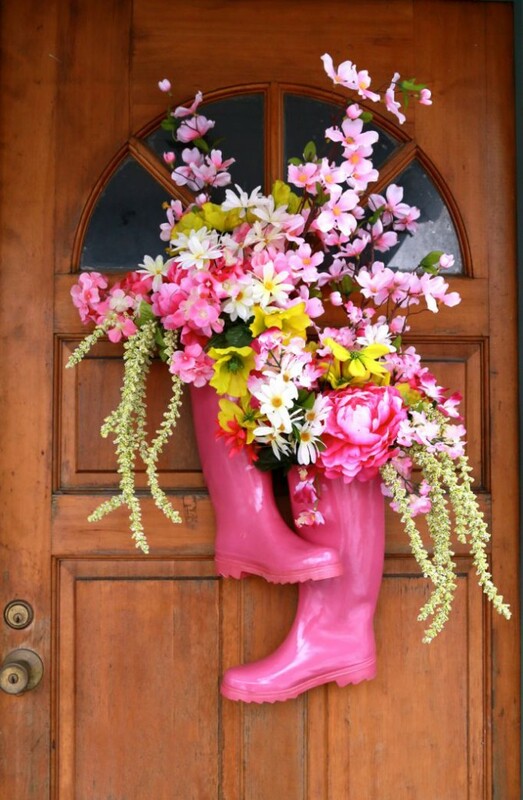 I LOVED this idea – I had several old boots in the car shed – grabbed a pair scrubbed the dirt off and sprayed them a BRIGHT yellow and popped the flowers in – absolutely LOVE the results! Thanks for another GREAT IDEA!!! 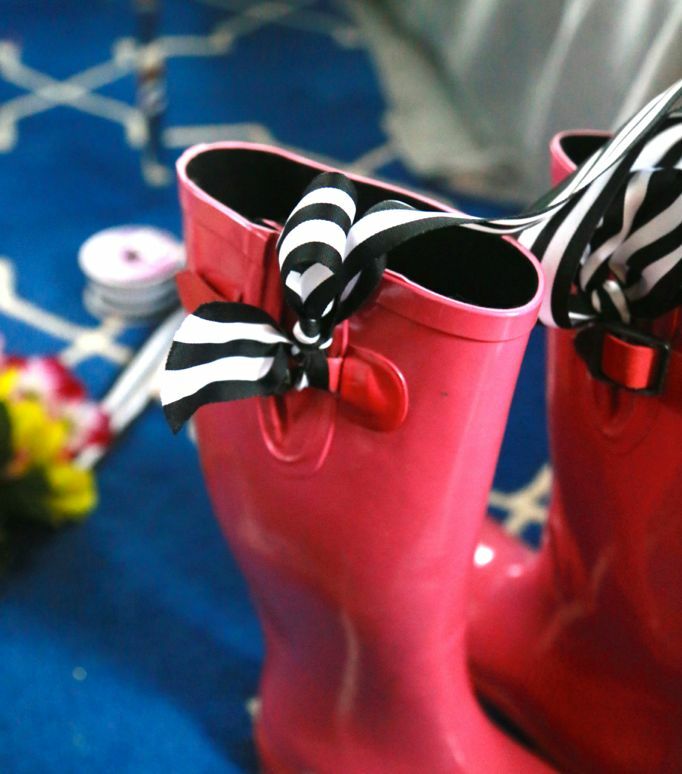 Florals: Baby Shower Boot Swag – Aunt Peaches < Liked it!